While I was on vacation, I stepped away from most forms of social media to enjoy quality family time. The exception being selfishly sharing pictures from Disney on IG, twitter, and our FB page. However, before I left, I saw so many of my blogging friends linking up with the Nester for her 31 Day Challenge. I really wanted to link up but wasn't feeling inspired and didn't want the "pressure" of daily blogging while on vacation. Last night I was still feeling the tug to join in. It's too late to officially link up with The Nester but I am taking on this challenge! Multiple times a month I gripe about how I don't pull out my "big" camera enough and how I document our lives via my iPhone. While I'm glad I do have pictures - I want to make an effort to capture our memories in a higher quality than my iPhone allows. Even if it is just with our point and shoot, I want real pictures on a daily basis! Being at Disney, and capturing fun memories, really made me long to start carrying an real camera with me at all times so I don't miss anything. 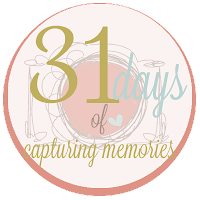 So, this month, I will be blogging daily about capturing memories. I might just post a picture with a few words about that moment or I might post some helpful tips I've learned about taking pictures of my kids - nothing fancy (I don't know anything fancy) - just tips from one mom to another mom on how to successfully document life! I may have two posts some days - one for the 31 day challenge and another of "normal" blog content so expect to see my much more this month! I'll also be playing catch up for days 1-7. I'm probably going to back date my posts so be sure to look through my archives to see what memories I captured last week! And I have to give Tiffany a big shout out for my 31 day button! I emailed her last night and had this beauty this morning! She knows me and my style so well that she hit the nail on the head with her first draft to me! Also, if you are participating in this challenge as well, leave a comment and let me know! I marked my entire reader as read since I got so far behind last week so I am way out of the loop! Just now catching up on your posts! I'm loving your pictures so far! I've been participating. I'm actually surprised I've lasted this long. haha! But I love that my topic is making me stop and enjoy and capture the moments of our days.